Amazing Christmas Gift Idea - When you want cool Christmas gifts to give your family or friends who is travelling often, you\'ve come to the right place. The pillow is designed specially for Xmas, with joyful color and pattern,so you\'ll be the gift-giving champ yet again. It will last for years of use and will remind your loved ones that you care about them. ☁️ Comfortable Design: The travel pillow is covered by soft microfiber pillowcase and with built-in high quality, resilient and extra dense memory foam which molds perfectly to your neck for maximum and ultimate comfort support for customized fitting, specially comfortable for those people having trouble holding the head up and need support or to sleep in an upright position. The Sleeping mask will offer soft and cooling feel.  Light and compact - The set is lightweight, portable, and perfect for traveling by car or airplane. Includes a protective plastic package as traveler bag, that holds premium quality memory foam neck pillow and the fine microfiber eye shade in one place. Great for traveling use in a car, truck, bus, train, or plane, and also for lounging at home or by the pool. You can use them at home or outdoor, enjoy the cozy feeling to rest and sleep better. 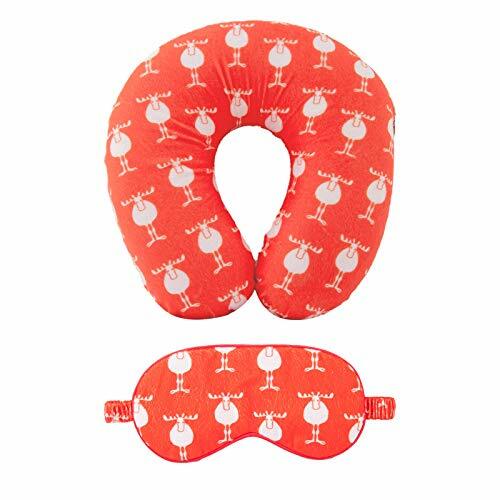 Easy to use and care: The neck pillow wraps gently around the neck for relaxing the head and neck muscles and provides super soft and best support simultaneously to the head, neck, and chin while sleeping upright without getting a stiff neck. The Sleeping mask just provide a releasing mode for a better rest. If your pillow and eye mask gets dirty, just take off the pillowcase to wash it. The zippered cover is machine-washable. Always use a clean pillow and eye shade! ❤️Moonen Guarantee. We\'re determined to bring you better living and satisfaction with great products and services. We offer a 30 day return and replacement service. Please don\'t hesitate to contact us if you need any help from us, we\'re here for you service@moonenhome.com. Love the flannel covered memory foam and the happy reindeer print!